A little bit of flash in the right place with applicable algorithms goes a long way, an example being the Seagate Enterprise HDDs with enhanced cache feature. This is the seventh and final post in this multi-part series (read part six here) based on a white paper hands-on lab report I did compliments of Servers Direct and Seagate that you can read in PDF form here. The focus is looking at the Servers Direct (www.serversdirect.com) converged Content Solution platforms with Seagate Enterprise Hard Disk Drive (HDDs). The focus of this post is comparing how HDD continue to evolve over various generations boosting performance as well as capacity and reliability. This also looks at how there is more to HDD performance than the traditional focus on Revolutions Per Minute (RPM) as a speed indicator. There is more to HDD performance than RPM speed of the device. RPM plays an important role; however, there are other things that impact HDD performance. A common myth is that HDDs have not improved on performance over the past several years with each successive generation. 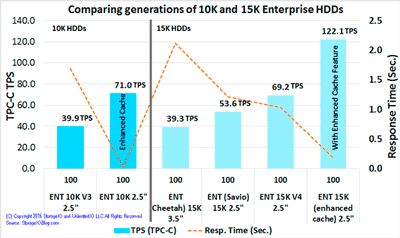 Table-10 shows a sampling of various generations of enterprise 10K and 15K HDDs (14) including different form factors and how their performance continues to improve. Figure-9 shows how performance continues to improve with 10K and 15K HDDs with each new generation including those with enhanced cache features. The result is that with improvements in cache software within the drives, along with enhanced persistent non-volatile memory (NVM) and incremental mechanical drive improvements, both read and write performance continues to be enhanced. Figure-9 puts into perspective the continued performance enhancements of HDDs comparing various enterprise 10K and 15K devices. The workload is the same TPC-C tests used earlier in a similar (14) (with no RAID). 100 simulated users are shown in figure-9 accessing a database on each of the different drives all running concurrently. The older 15K 3.5” Cheetah and 2.5” Savio used had a capacity of 146GB which used a database scale factor of 1500 or 134GB. All other drives used a scale factor 3000 or 276GB. Figure-9 also highlights the improvements in both TPS performance as well as lower response time with new HDDs including those with performance enhanced cache feature. The workloads run are same as the TPC-C ones shown earlier; however, these drives were not configured with any RAID. The TPC-C activity used Benchmark Factory with similar setup and configuration to those used earlier including on a multi-socket, multi-core Windows 2012 R2 server supporting a Microsoft SQL Server 2012 database with a database for each drive type. HDDs are very much alive complementing SSD and vice versa. For high-performance content application workloads flash SSD solutions including NVMe, 12Gbps SAS and 6Gbps SATA devices are cost effective solutions. HDDs continue to be cost-effective data storage devices for both capacity, as well as environments that do not need the performance of flash SSD. For some environments using a combination of flash and HDDs complementing each other along with cache software can be a cost-effective solution. The previous workload examples provide insight for making cost-effective informed storage decisions. Evaluate today’s HDDs on their effective performance running workloads as close as similar to your own, or, actually try them out with your applications. Today there is more to HDD performance than just RPM speed, particular with the Seagate Enterprise Performance 10K and 15K HDDs with enhanced caching feature. However, the Enterprise Performance 10K with enhanced cache feature provides a good balance of capacity, performance while being cost-effective. If you are using older 3.5” 15K or even previous generation 2.5” 15K RPM and “non-performance enhanced” HDDs, take a look at how the newer generation HDDs perform, looking beyond the RPM of the device. Fast content applications need fast content and flexible content solution platforms such as those from Servers Direct and HDDs from Seagate. Key to a successful content application deployment is having the flexibility to hardware define and software define the platform to meet your needs. Just as there are many different types of content applications along with diverse environments, content solution platforms need to be flexible, scalable, and robust, not to mention cost effective.